Quite possibly the best anime ever. Mushi-shi was one of the first animes I ever watched, and it definitely got me hooked. The art is fantastic, and the music and settings all complimented each-other very nicely. Mushi-shi isn't about resolve... It's about the wonders of nature... It does not answer why?... or how?... It is simply accepted. It shows that there are somethings you will never know, and the wonders the mushi have to offer. Heh it is not merely A show; it's a way of living, and I truly mean that. To observe, to admire, to stand in aw, of the world that is what Mushi-shi is about. You may believe anime is not an art. However, you are wrong every time on this account. Mushi-shi is not merely art its a Masterpiece. Just like the mushi you won't find anything like it in the world... That is... as of yet. 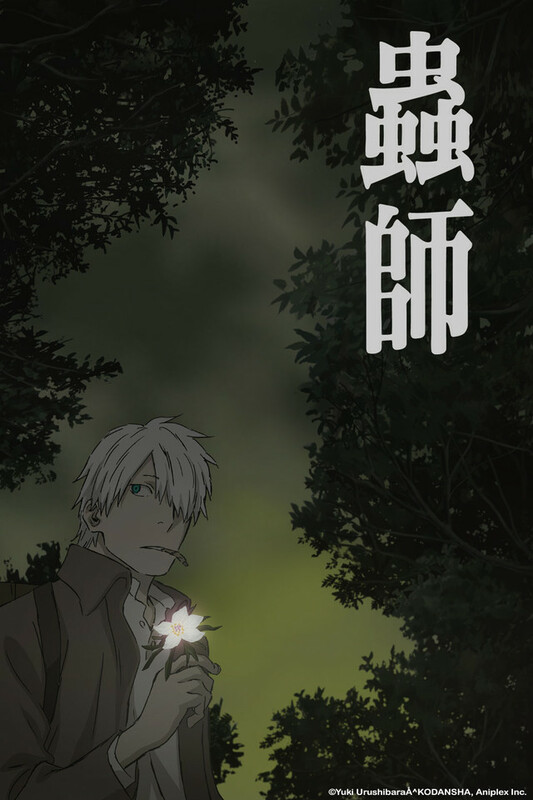 Mushishi is a masterpiece and will likely always stand as my absolute favorite, but Mushishi isn't for everyone; not by a long shot. People say it's slow, that its episodic nature results in shallow characterization, some even say it's just too weird. I say that its pacing is its greatest virtue, and that its characters have a greater range of genuine emotion than the overwhelming majority of anime could ever hope for. I was just telling my husband: this anime for some reason excites my senses like no other anime has. Art and soundtrack are pleasing to the eye, nothing hurts or overwhelms like I have experienced in many other anime. There is a thrill, because of the mystery. There is a chill, because of the supernatural. There is an aching, because of the sad story. There is a warmth, because of the hope. All of that in a very subtle tone, perfectly meshed together. First off, If you enjoyed this anime, there is more! Crunchyroll actually is missing the first 26 episodes, which apparently aired back in 2006. Don't let that stop you from starting here though. Mushi-shi is thought-provoking, patient, and gorgeous to behold. Each episode is a story in itself, reminiscent of fairytales. Each story is tied together by the protagonist, who is there to witness each event and help. It's gorgeously animated, the music is lovely, and the strange creatures summon similar feelings as "Spirited away". It makes me want to know more about the world in the series. You could freeze frame on any of the gorgeous backdrops and make them a painting in their own right. I like to watch this series alone, when there isn't anyone else to interrupt my thoughts afterwards. It's bittersweet, as there isn't always a happy ending. Anime is a visual medium, but it realizes itself best when there is a great story. In this world there is an ever present wonder, invisible to most, existing everywhere - mushi. They occasionally interact with humans and there are humans who can see them, and some make a study of their species and affects. I loved the first series and mourned the end, so it is with renewed joy and even greater admiration I extol the virtues of the newest chapters. challenge that people and their personalities (psychologies, neurosis, limitations) have on the interaction with the mystical but indifferent force of the mushi. Never watched a show that makes you feel happy to be alive. Each episode is completely independent of each other, and always ends in a heartwarming manner. If you want to watch a show that makes you relaxed and optimistic, this is the show. This is awesome. Nothing else matters. Seriously, some people complaining about how the show changed. Well perhaps this scenario wasnt taken from the manga. BUT I dont' care about that. I mean, it's not like im freaking out or anything. It's not like the most beautiful anime ever is coming back or anything. Mushi-shi is such a unique and beautiful anime. Each episode leaves you with a deep sense of calm and a longing for more stories. As others have said the art, the music, the stories, and really everything about it is excellent. I definitely recommend it to everyone I know who enjoys anime (and even to those who do not). Simplistic beauty that will leave you satisfied. The series simplistic stories and holistic values make this one of the most beautiful series I have ever seen. Each episode is its own tale and I love how you can pretty much jump in any where in the series and enjoy an episode without feeling lost. Also the art and music just add to it's delicate beauty and mellow entertainment. This show is truly a masterpiece. I am so pleased ( just as other fans are) that they are continuing with this wonderful series! If you are a fan of anime or just want to watch something mellow and relaxing, this is definitely the show to watch.